Get the best deal on your next home right here, before it ever goes on the open market. You will have access to our inventory of homes before anyone else, even Real Estate Agents! Complete this form to be on my Homebuyers Hot List. 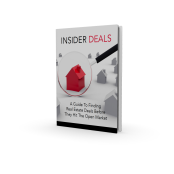 Get instant access to the best deals and my FREE report with 7 ways to get a great deal and the 22 best online sources for finding your next home.